The Retina iPad Mini will initially be available at Apple Retail Stores exclusively through Personal Pickup, Apple noted today in a press release. Personal Pickup is the service that lets purchase any Apple product from its online store, and then let you pickup the device at the local retail store. Therefore, if you simply cannot walk in an Apple Store and hope to pickup a Retina iPad Mini as it will not be available for purchase. Apple announced iPad mini with Retina display is available starting today. The new iPad mini brings all the pixels from the 9.7-inch iPad to its 7.9-inch screen, delivering razor sharp text and detail in an amazingly thin and light design. It features the powerful and power-efficient Apple-designed A7 chip with 64-bit desktop-class architecture, ultrafast wireless with faster built-in Wi-Fi and expanded LTE cellular connectivity, iOS 7 featuring hundreds of great new features and access to all 475,000 apps designed specifically for iPad. 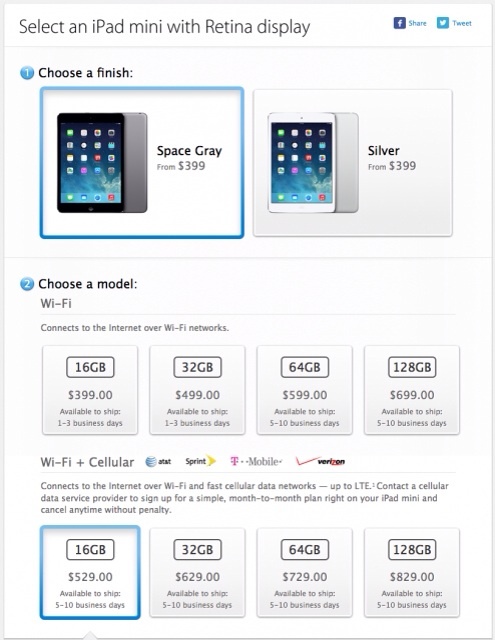 Once supply can catchup to demand, Apple will most likely begin offering Retina iPad Minis in the store. Currently, Retina iPad Minis have a ship date of 1-3 business days for entry level models, and higher end models like the 64GB version have a 5-10 business day ship time. The device will also be available at AT&T, Sprint, T-Mobile, Verizon Wireless and select Apple Authorized Resellers.